In early September Florence hosts a unique event, that only Florentines know and celebrate: the Festa della Rificolona, the Festival of paper lanterns. This typical Florentine festival dates back to the Middle Ages. Since then people went on pilgrimage from Florence surroundings to Santissima Annunziata Church for celebrating the birth of the Virgin Mary on September 8th. They carried a paper lantern to light the way. Today the Rificolona Festival is no longer a religious celebration, but a festival for children. 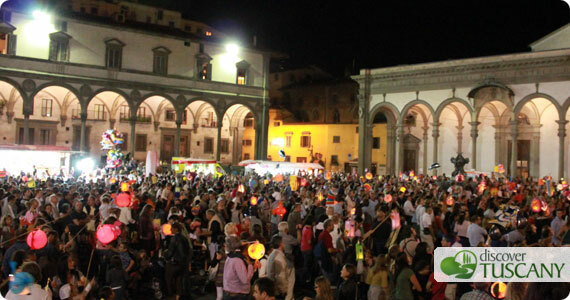 This year as well, Florence will be lighted up by hundreds of paper lanterns, that will parade along the historical center. On September 7th the parade will start around 8.50 pm in Piazza Santa Croce and will end up in Piazza Santissima Annunziata around 10.00 pm. The parade will be guided by the marching band “Sound Street Band” from Santa Croce, through Borgo dei Greci, Via dei Gondi, Piazza della Signoria, Via Calzaioli, Piazza Duomo, Via dei Servi and Santissima Annunziata. On September 8th the parade will then be on the Arno River near Ponte Vecchio, starting at the Rowing Club.